It is a great piece talking about the concussion problems in the sport, and more specifically, high school football. I played high school football. For four years, it was a huge part of my life and one of my main focuses. After high school, I worked as an equipment manager for the Wisconsin Badgers for another four and a half years. So I have quite a bit of experience and time around the game of football. Obviously, concussion awareness has shot up over the last few years. Going back to when I was in high school, I definitely fell into the camp of “shake it off and get back out there”. There was nothing that was going to keep me off the field. I played through many injuries, but thankfully no concussions. I did, however, have problems during my junior year with terrible headaches by the end of most games. As the science continues to progress and more info comes out, I find myself completely changing my views on concussions and football. I love football. I’m a huge fan, ask anyone who knows me. But I’m starting to wonder if there should be a place for football in the future.The more we learn about concussions, the worse it seems. And there’s no good way to deal with it. We expect helmets to fix things, but they aren’t made for that kind of protection. We can keep changing the rules, but so far things haven’t changed in terms of concussions. And if things change too much, the sport will cease to be football anymore. Far worse, though, is the culture within football. Way too many players underestimate the damage they are doing. I know I did. And I watched countless collegiate athletes adamantly oppose switching to a safer helmet because of the way they looked. (They’ve since made the newer helmets better looking, but the concern over how gear looks will continue to be a ridiculous barrier to protection. Also, concussions haven’t decreased with safer helmets.) Even with all the science coming out, too many kids (also coaches and parents) are ignoring the risks or plain don’t know about them. Another problem is that far too many kids don’t realize that their football careers aren’t going much further than high school. Positive thinking is fine, but a little realism might help kids realize that they shouldn’t be risking permanent brain damage for something they most likely won’t achieve. Plus, the damage is hard to see physically afterwards. Players sitting out look okay, prompting people to question if their milking their injury or not dedicated to the team. Concussion education has increased, but the entire culture around football needs to change. There are plenty of injuries that people can fight through. Concussions aren’t one of them. I love football, both watching and playing. But maybe football should die out. The cost is too high for the players, and too many don’t even realize what it is costing them. Sure, getting paid millions of dollars is quite an incentive to play, but those millions can’t do anything for the brain damage. And that’s only the select few that make it all the way to the NFL. What about the millions of kids who don’t make it, who don’t have millions of dollars to show for their concussions? Weekly Progress Report #5 — Already? It’s really already been 5 weeks? I don’t feel good about that. I know moving got in the way for awhile, but I really don’t feel like I’ve accomplished much in the way of losing weight/getting healthier. Drastic changes coming tomorrow though with Operation Suit Squeeze. Eating: Even though I don’t feel like I’ve accomplished much, I would say I’ve made a lot of progress in terms of eating. Kind of enjoying the vegetarian meals. I think I’ve been eating less for the most part. Less overeating too. Just not seeing much yet. So this week we had a basic turkey/colby cheese sandwich, lasagna roll-ups, and a vegetarian curry (for more info check out the vegetarian adventure–it’ll be up soon if you’re on top of things). The lasagna roll-ups aren’t particularly healthy, but we were able to make them without having to buy too much. And they’re delicious. But, of course, I forgot to take a picture of them so you’ll just have to imagine. Plus there were enough leftovers for me to eat them three nights in a row. All in all, pretty good week. Nothing too fancy. No overeating. With one exception. Working Out: Honestly, working out continues to be my downfall–and probably the reason for my lack of progress. I played tennis once with my brother. Ran with the dog for a little while once. She still struggles to get the whole running thing versus stopping and smelling everything. But that’s it. And that’s a problem. None really. I need to stop being lazy. This Week’s Plan: Consistent workouts start tomorrow. Yay for running! (Blech.) Keeping up the momentum with eating but cutting out more sweets. So here’s the situation. Last year, I cashed in my birthday and Christmas presents from my parents for a nice suit. My first and only suit. I needed it for medical school interviews. Fast forward a year. I just finished all of my secondaries. Round two of interviews are coming up. Aaaand my suit doesn’t quite fit anymore. Awesome. I know what you’re thinking–take the suit in and have them do some alterations. As I have nooo money, I’m going to try to avoid that. (Plus it makes for good motivation to get into better shape). The vest and coat fit okay still. The coat’s a little tight across the shoulders, but it’s more of a comfort thing than anything else. Besides, I don’t really think I can de-broaden my shoulders. I’ll alter it down the road. The pants are the problem. Can’t get ’em on. At all. I need to lose at least a half inch off my waist. Maybe a full inch if I want to breath comfortably for the whole interview. So the time has come for drastic measure. I’m talking set-in-stone workout routine. Smarter eating. A complete ban on sweets (like I said, drastic measures). I figure I’ve got 4-8 weeks before I really have to worry about interviews. The plans will get hammered out over the weekend. Everything will be chronicled under the Operation Suit Squeeze category. I’m going to breakdown what kind of things I need to look out for and avoid, how I’m going to eat, and what I’m doing to work out. This better work. I’d really like to breathe during interviews. It’s Thursday. Time for weekly links! Only three links this week, because I we’re getting heavy on some stuff. Sorry for the lack of posts this week. There’s a big one coming tomorrow morning and the vegetarian adventure has been postponed to saturday this week. Hang in there. I know you’re excited. 1. “Fat People Are Not Our Enemy” This article talks about a lot of things. It’s main point is that we need to stop hating on ‘fat’ people, citing an article that found overweight people to be just as healthy as their skinny counterparts. A couple things here, from me. First, being a little bit overweight is not necessarily a bad thing. Having a little bit of fat can help the body be more resilient, help it survive difficult times. That is not an endorsement to gain weight, though! Second, and I agree with the article on this, BMI is a terrible way to measure obesity. The nice thing about BMI is that it is easy to calculate. Therefore, it’s very useful to get a general idea on the population from a public health standpoint. However, easy to calculate also means a lot of error. For example, when I was in some of the best shape of my life during high school, calculating BMI put me at the border of overweight and obese. I most definitely was not! BMI oversimplifies and it doesn’t take into account muscle mass, instead using a simple height vs weight set-up. However, the article claims that our reliance on BMI has changed what we consider healthy. I would disagree with that. How many people do you know judge health based on BMI (minus healthcare workers)? I’m going to guess not many. Most people can tell the difference between an obese person, someone who is an unhealthy level of overweight, and someone who is maybe overweight but still healthy. Maybe the war on fat has gone too far. Discrimination is never a good thing. But I would not say that science thinks being too heavy is good for you, as the article concludes. 2. “Obesity in America: How the Social Norm on Weight Has Shifted” In sticking with the obesity discussion, this article talks about people’s views on obesity. Most interesting for me was the high numbers of people who skew themselves downward on the obesity scale. (Note: I don’t know if they used BMI or not for the polls). Also, science in this one claims that up to 80% of chronic diseases can be linked to weight. I can understand people’s confusion with science. I’m going to guess the number in actuality comes in below 80%, but I’m also going to believe this side of things a little more than the claim that heavy is good. Anyways, I love that this article emphasizes the need for bottom-up change. Being honest, I don’t put much hope in top-down change these days. Too much stupid bickering and partisanship for anything to get done. So any changes are going to have to come from below. The community example is nice, and it would be cool to see this pop up in other places too. Good article all around. 3.“Westerners ‘programmed to eat junk food'” Back to busting DNA articles! I’m not arguing with the study. It’s very possible, especially the survival side of things. BUT, the title again! I’ve found that titles tend to be very sensationalist since I’ve started this blog, usually exaggerating the actual claims in the article. Yes, westerners may crave foods that are less healthy due to genetic heritage. But it doesn’t MAKE people eat the unhealthy foods. I crave sugary foods. Constantly. Terrible sweet tooth. Is this because of my ‘switch’? Maybe, but I don’t eat sugary foods all the time. There’s this useful thing called consciousness which allows me to choose what I do and don’t eat. The article doesn’t touch on this at all, mostly just quoting the scientists. Who, I should add, go no further than mentioning that it could control craving and explaining it’s origin. Not saying we are programmed to eat junk food. Saying we might have a genetic based desire for junk food. Programmed is a very different thing. Programmed to crave versus programmed to eat is also very different. Whew! I’m done now. First of all, pictures! 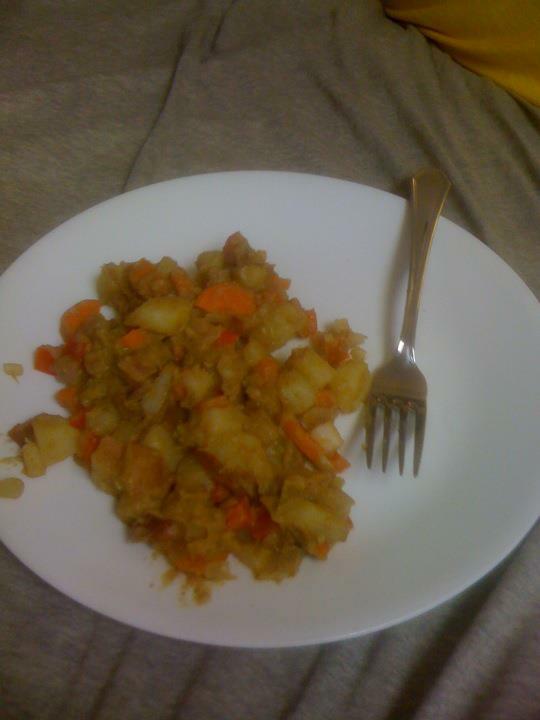 Since I was unable to post it last week, here’s my epic fail of a curry. Moving on then. It’s week 2 of the vegetarian adventures. I actually found a lot of different recipes this week, with a little help from my tweeps (twitter-peeps). I ended up using two recipes off of a great blog at flavorfullblog.blogspot.com. 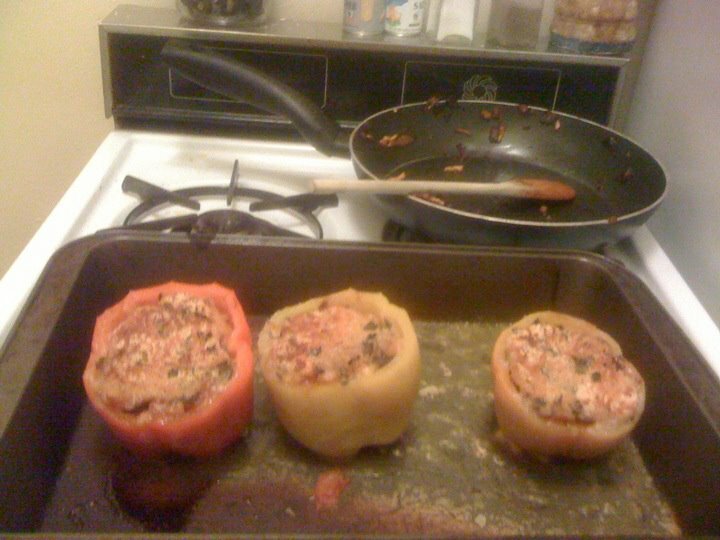 The first was a spicy orzo-stuffed pepper. 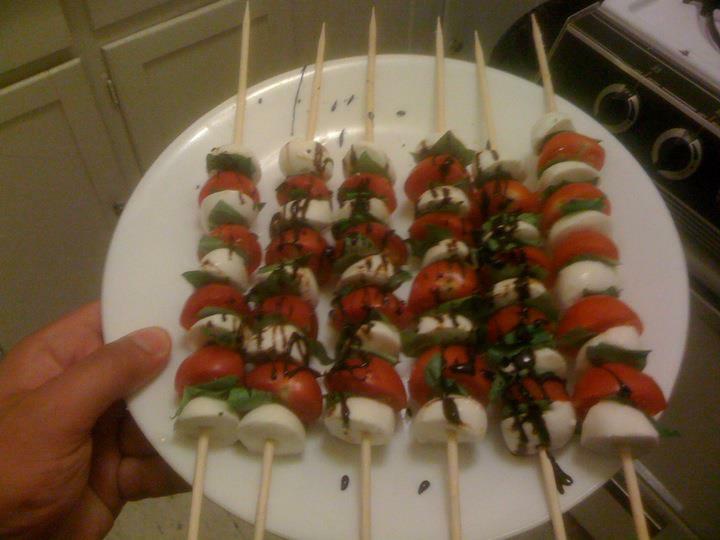 Pretty easy to make, very tasty, no problems. I did, however, have a hard time shaking the feeling that some italian sausage mixed in there would have made them great. Sorry, it’s in my blood. I’m working on it. This takes time. The breadcrumbs and parmesan cheese helped me survive the lack of meat. It was a little more time consuming than I expected. This caused me to let the balsamic vinegar cool too much, and it went kind of molasses on me. Whoops. The mozzarella was good though. Not sure I was a huge fan of the basil/balsamic vinegar combo though. Something just seemed a little too strong. And for bonus points, I just realized I didn’t eat any meat at all today. This is unprecedented. I feel kind of weird. Then again, I ate a donut and half a cinnamon roll. But I think I deserve credit for that as well. I resisted the urge to eat 1-5 more donuts. No easy feat with my sweet tooth. 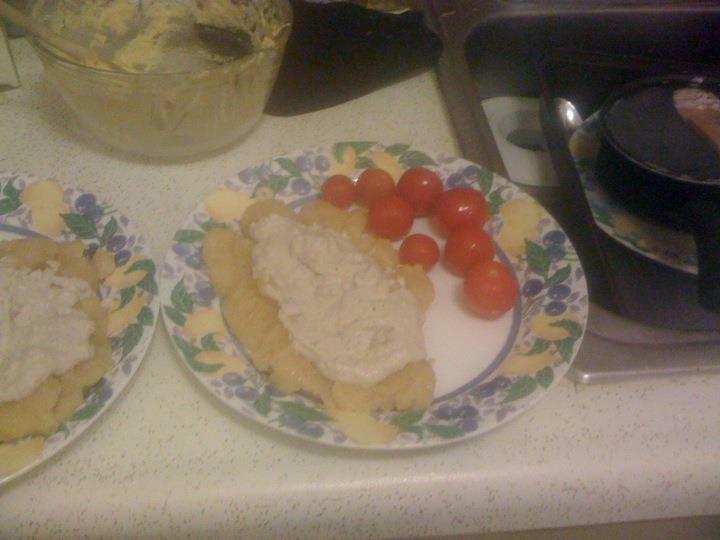 Overall, very successful second vegetarian meal. Might go eat a cookie to reward myself. Baby steps.